Pear engagement rings come to us from a long lineage of diamond cutting styles, stemming all the way from the late Middle Ages. In the beginning, diamonds and other gemstones were typically used in their natural octahedral states. Over time, jewelers developed different techniques for forming diamonds into unique and symmetrical shapes, including pear shapes. Although the initial diamond cuts produced by European jewelers were quite crude, their techniques began to evolve steadily over time, thus leading to the work of a very important Flemish jeweler known as Lodewyk van Berquem. Lodewyk van Berquem was the first artisan to introduce the applied concept of absolute symmetry by utilizing his hand-made scaif device to form stones into a shape that was historically known as the pendeloque shape, also then known as the briolette cut. This cut was the prototypical ancestor of the pear cut center diamonds we offer at Knox Jewelers today. 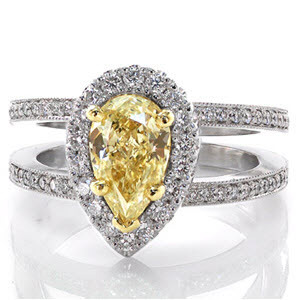 This cut was extremely popular during the Victorian era in Europe due to its symmetry, refinement, and inherent beauty, all of which are characteristics found in the modern pear engagement rings we offer in the present era. Pear cuts are especially prized for their elegance, and we are very proud to offer a line of beautiful rings of this form hand-crafted by our in-house artists. As you might imagine, there are almost an infinite number of ways to customize these rings, and at Knox Jewelers we offer them in a great variety of unique styles, each of which has its own individual character and spirit. The best way to discuss the different customization options and styles available for you to choose from is to talk about the actual rings that we have made in the past. Without further ado, let’s take a look at some of the high quality engagement rings we have custom designed for our valued customers. 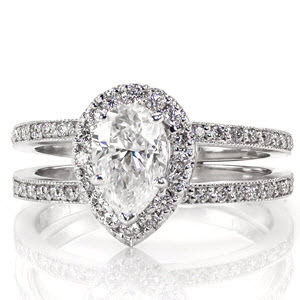 To start, let’s take a look at our Pear Cielo engagement rings. This beautiful design features 14k White Gold and a 1.00 carat pear cut center diamond surrounded by a luxurious, micro pavé adorned halo. This ring is an example where the diamond takes center stage in the piece. All other elements of the ring orbit around the center diamond, thus drawing the eye toward it. 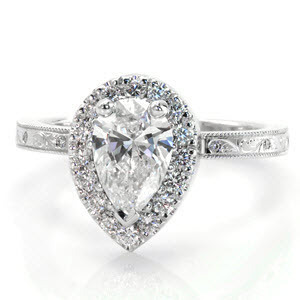 Its teardrop shape that is customary of pear cut diamonds gently moves the eye around the remainder of the piece, thereby drawing in all of its unique and pristine elements. 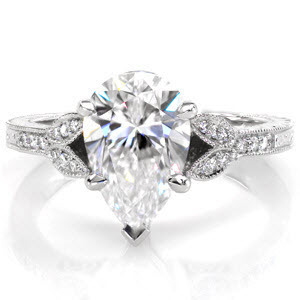 Another exquisite design we offer is our Design 2545 engagement ring. This pear engagement ring features a beautiful 1.50 carat full bezel set pear cut diamond with a beaded milgrain edge that accentuates the center stone. The 14k yellow gold provides a striking and beautiful contrast with the center diamond. The geometric design of the ring incorporates smooth but linearly inspired curves to give it an organized and ornate appearance. All of the elements of the antique inspired piece are oriented around the center cut diamond, though other stones can also be incorporated into the center. 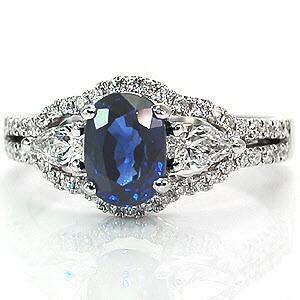 Of course, pear cut center stones are not the only configuration we have available. 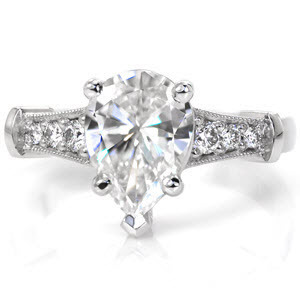 Additionally, we also offer diamond rings in a side stone configuration. Our Venus engagement ring, in particular, is a beautiful example of the side stone settings. The center gemstone of the Venus ring is the primary focus of the piece. Branching off from the center stone are two pear shaped diamonds which flow with the two rows of micro pavé that circumvent the entirety of the ring. Our Venus engagement ring showcases the beauty and intricacy of side stone pear cut diamond settings. At Knox Jewelers, beautiful designs are the lifeblood of our business. Our pear engagement rings hold within them a long history of beautiful craftsmanship, tradition, and elegance. Of course, the pear engagement rings we have listed in this post are just the tip of the ice berg: We offer a huge variety of uniquely hand crafted engagement rings that incorporate pear cut diamonds in both center and side stone configurations. We hope that you will take a very close look at our exquisite selection of these expertly crafted rings. 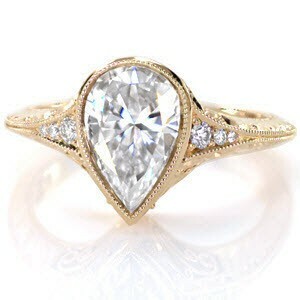 Naturally, if you have any questions at all about our pear engagement rings, please do not hesitate to contact us. We look forward to designing the perfect ring for you!